• Monthly growth of 0.6% not enough to keep average prices above levels recorded in November 2016. • Typical property valued at £167, 401 – compared to £171,286 at the end of November 2016. • Prices rising fastest in Sunderland, Durham City, Jarrow and Easington, but falling fastest in North Shields and Blyth. • Average rents almost identical to 12 months ago, but up 6.5% on 2015 levels. KIS Housing NOW – Housing North of Watford - pulls together the most authoritative and up-to-the-minute data and the expert market analysis of the KIS Intelligence Service to give you an indispensable guide to the state of the North East property market. North East property prices have fallen below their 2016 levels – despite rising 0.6% in November. Figures from regional property firm KIS show that average house values in the region have risen by an average of £1066 in cash terms over the past four weeks, recovering most of the 0.8% fall recorded in October. Average property values are 2% below those recorded this time last year – a fall of £3886 in cash terms. A typical North East property is currently valued at £167, 401 – compared to £171,286 at the end of November 2016. Property prices are up in 15 of the 20 areas surveyed compared to October 2017, rising fastest in Sunderland (2.9%) Durham City (2.6%) Jarrow (2.3%) and Easington (1.5%). Prices fell the most in North Shields (-2.4%) Blyth (1.2%) Tynemouth (1.1%) and South Shields (0.6%). Prices are currently below levels recorded 12 months ago in 18 of the 20 areas surveyed – but are up year-on-year in North Shields (1.1%) and Darlington (0.7%). Homes in Jarrow (-9.3%) South Shields (-7.3%) Sunderland (-5.8%) and Easington (5.7%) have performed the weakest over the past 12 months, properties in Jarrow having lost £13,262 of their value in cash terms. North East property prices rose by 5.6% in November 2016, a year-on-year rise of 8% from 2015. Prices rose 1.9% in November 2015 (5.6% annual) and 0.2% in November 2014 (3.1% annual). Average North East rents have fallen to £589 per calendar month. The figure is consistent with the £580pcm recorded in November 2016, but 6.5% higher than the £553 recorded in November 2015. Easington (£388) is the cheapest place to rent in the North East out of the areas surveyed this month followed by Blyth (£422) and Houghton-le-Spring (£450). 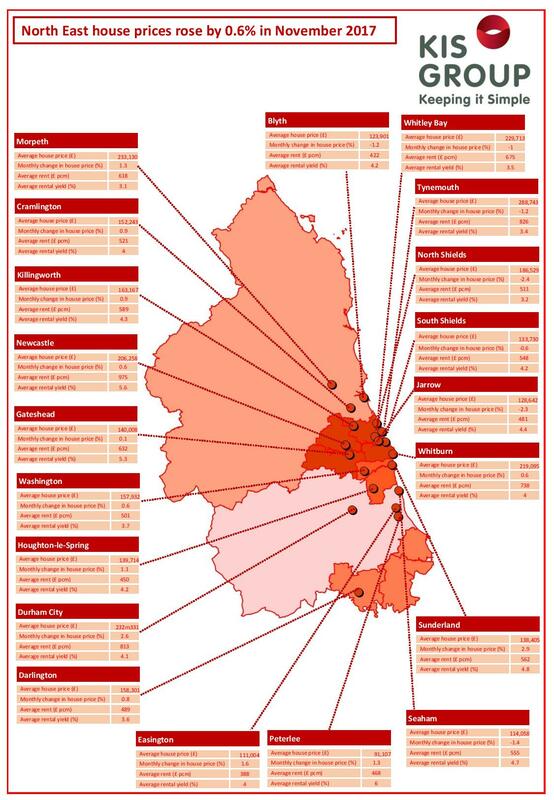 Durham (£813pcm) and Tynemouth (£826pcm) remain the region’s most expensive. Peterlee regains its crown as the region’s Buy to Let Capital, with an average return of 6% for investors. Other strong performers for rental yield include Newcastle (5.6%) and Gateshead (5.3%). Ajay Jagota, founder and Managing Director of KIS Group, the first letting agent in the UK to abolish deposits. He is also founder of Dlighted a deposit replacement insurance that delivers a Zero Deposit renting solution offering landlords over £600,000 of asset and income protection for rent, damage and legal cover. “North East homeowners might be concerned when they hear that property prices are down 2% year-on-year, not least as they were 8% up this time last year, but it’s important to remember that prices were abnormally high in November 2015 so this may be an unhelpful comparison. “What is more important is that they are up 0.6% month-on-month. Next month’s figures will give us a much clearer picture of home regional property prices have performed over the course of the year. “It’s very noticeable this month that price growth seems to be driven by the south of the Tyne in places like Sunderland, Jarrow and Easington. In the past we’ve tended to see stronger growth north of the river. “In a time of low wage growth and economic uncertainty it’s good news for renters that rents are almost unchanged over the past 12 months, although it remains hard to argue that their tenancy deposits would be better off being put toward a deposit for their own property – they are clearly capable of paying their landlords mortgage after all.